Fun and Easy Beginner Quilt Patterns! 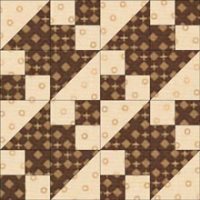 The Jacob's Ladder quilt pattern is a wonderfully graphic quilt. Constructed from four patch and half square triangle units, it's a perfect choice for the beginning quilter who's ready to add triangle squares to their repertoire. Both are made from the same units, only their grids differ. 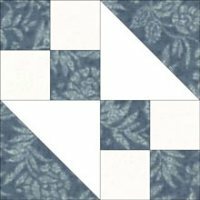 Neither block is easier or harder than the other, though the larger, 3x3 grid block creates more intricate quilt designs. All of the designs below are in straight sets with the exception of one quilt. With the strong diagonal movement through the block, an on-point setting doesn't add the drama it usually would for many other blocks. 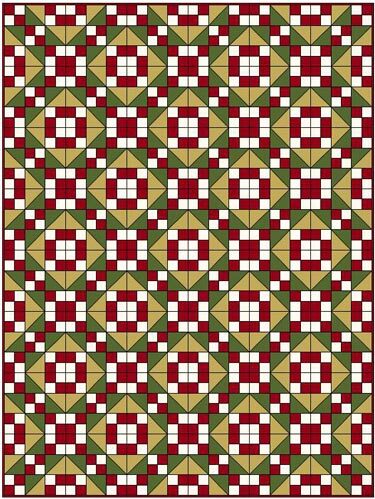 All the quilt blocks and quilt designs shown on this Jacob's Ladder design page were drawn in EQ7, a quilt design software program. It's easy to use and makes designing blocks and quickly changing quilt layouts a dream. 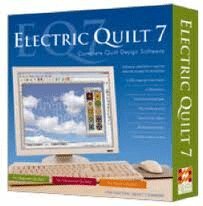 A wonderful tool I recommend to anyone creating their own quilt designs. This block, based on a 2x2 grid, is created from two four patch units and two half square triangle units. ...which would make a great block exchange for your quilting bee. This next Jacob's Ladder variation uses our 2x2 grid block and adds a simple variation. 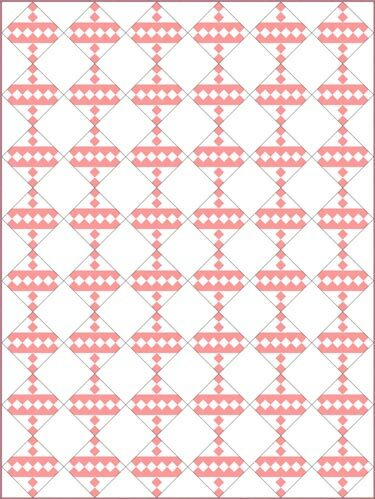 Take our pattern from above and flip the half square triangle units so that the darks are towards the outside (see right). Alternate the two blocks and strong, parallel, diagonal stripes emerge. 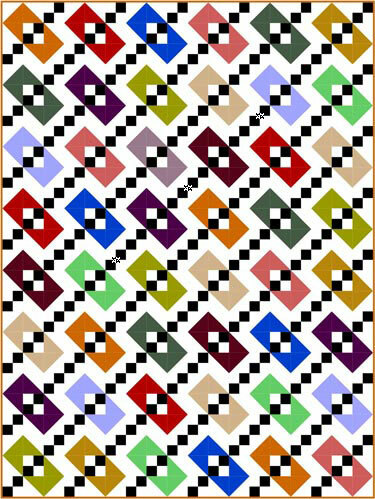 I've seen this layout in several antique quilts. Almost always two color. Almost always blue and white. Put four of our original blocks together. 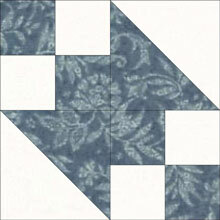 Orient them in the same direction to create a Jacob's Ladder quilt block variation called "New Double Four Patch". Add a stripped sashing and a nine patch quilt block for the cornerstones and you have this quilt design. Stunning. Graphic. The perfect quilt for the men and boys in your life. 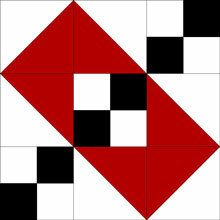 Some Jacob's Ladder designs are based on a 3x3 grid. Again, the color placement in the four patch units creates strong diagonal movement through the quilt. 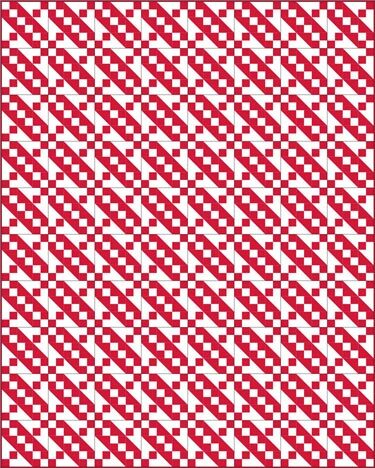 Two color quilts make a strong statement and this red and white version of the block (Figure 1) is no different. Patch outlines are omitted so as not to distract from the overall impression. Use the same 2-color block design (Figure 1), but in an on-point setting. 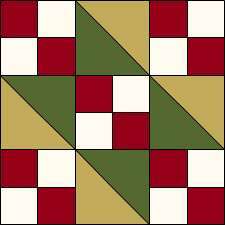 Add a solid alternate block for open spaces for quilting stitches. Use the same traditional, 2-color block from Figure 1. 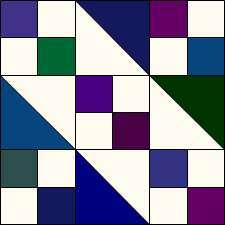 Use the same basic two color block, but reverse the orientation of the half square triangles. This block is also know as "Road to Arkansas". Choose a color palette and make many two-color blocks. Use the same fabric (in our case black) for the strong diagonal. Using four fabrics/colors completely changes the design. The strong diagonal element is still there. However, an equally strong pattern is created when the blocks are set together. To maintain the symmetry of this layout, you'll need even numbers of blocks in both the rows and columns. A great quilt to use up stash fabrics! In this next example, we've taken the basic 3x3 grid block from Figure 1 and positioned the fabrics in two different ways. 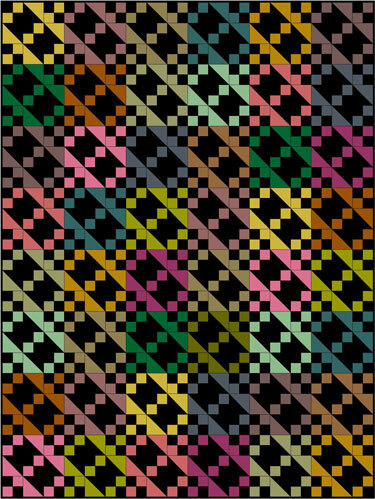 The result is a patchwork pattern where the blocks appear to weave through each other. Below left, the four patches create a light chain with a dark background. Below right, the four patches create a dark chain with a white background. Take a closer look. The only difference is that the half square triangle units are rotated 90 degrees. 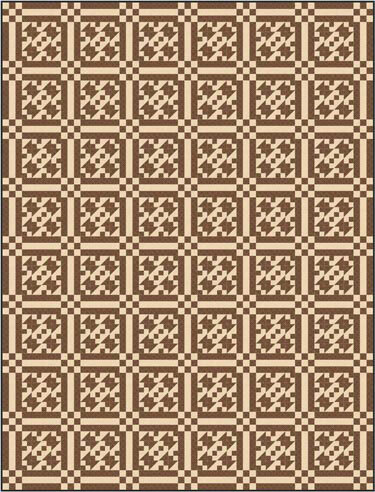 Alternate the blocks and rows to create this scrappy, woven effect. 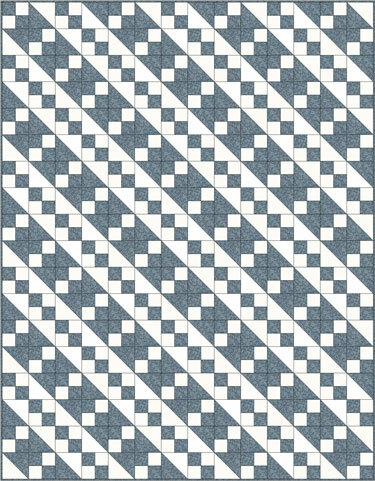 In our final design suggestion for a Jacob's Ladder quilt pattern, we've changed the block just a bit. There are now six half square triangle units and just three four-patch units. All the four patches are the same black and white patches for the whole quilt. 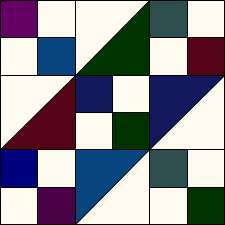 The half square triangle units are white and another color. 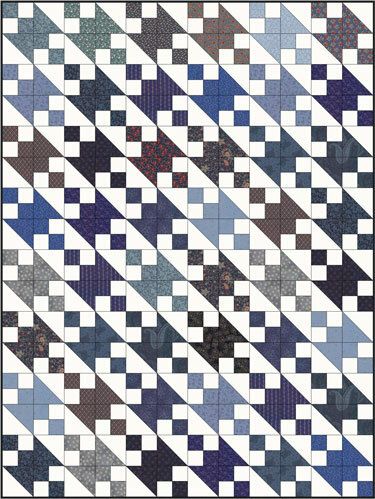 Which Jacob's Ladder quilt pattern will you choose for your next quilt? To make a four patch version of the block (also known as a Buckeye Beauty) click here. To make a nine patch Jacob' Ladder quilt block, click here. 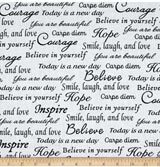 Or go to our Quilt Design 101 Series and find another quilt design that sparks your creativity! 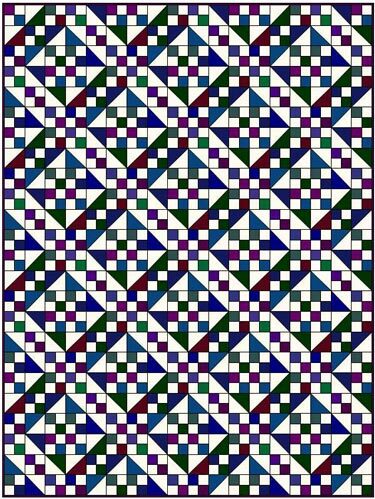 Not ready for the Jacob's Ladder quilt pattern but love the strong diagonal lines and movement? 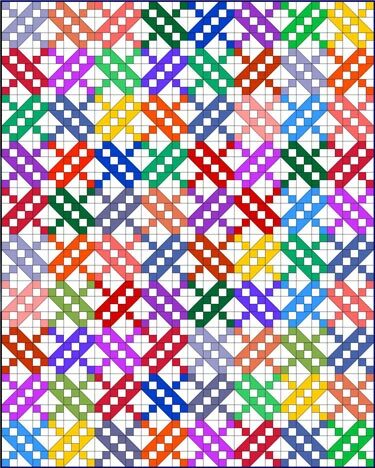 Then take look at our Irish Chain quilt pattern designs.